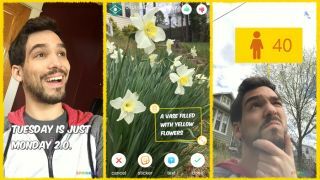 Snapchat (and more recently, Facebook) may have a slew of ways for gussying up photos, but what if you don't have time to dig through all those emojis, stickers, and geofilters to add to your latest selfie? Microsoft's new Sprinkles app takes over that task in a very Microsoft way, applying machine learning to auto-generate captions, stickers, and more with just a single shutter press. The ways Sprinkles uses Microsoft's artificial intelligence to spice up your pics are fairly straightforward. In our short time playing with the app, common suggestions included cliché catchphrases about what day it it, or slapping a cartoon mustache and hat near where the app detected a face. This isn't the first time Microsoft released an experimental camera app to the masses. In addition to its dedicated selfie-taking app, Microsoft impressed us last year with Pix, a smart camera app that uses machine learning and post-processing to get photos right the first time. In addition to generating Snapchat-style stickers and captions, some more unique features include filters that try to guess how old you are or find a celebrity lookalike using similar tech seen in Microsoft's Bing browser. Additionally, Sprinkle's CaptionBot filter wrote descriptions based on what objects, lighting, and facial expressions it sees, which is another cool-if-not-always-accurate feature. Sprinkles is available to download now for free exclusively for iOS, and while its attempts to bring AI abilities to the selfie game aren't always perfect, it's an interesting proof of concept of a future where zero effort will be needed for the next "TGIF!" selfie you send to social media.